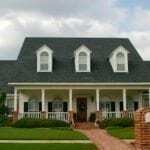 Home » Why does my roof have black streaks? 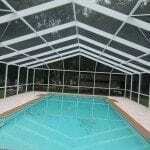 In Florida, you’ll see a lot of picturesque homes to match our beautiful weather. But one thing is out of place on many of these properties: black stripes bring down an otherwise perfect roof. “What is causing black stripes on my shingles – and what can I do to stop it?” is a question that we get often at Lightning Pressure Washing. The answer? You can blame gloeocapsa magma, a type of fungus that feeds on the composite that makes up your roofing. The more it eats, the more it grows – and you can watch its unfortunate progress across your shingles. Gloeocapsa magma isn’t just ugly. It can also deteriorate the quality of your roofing, cause the material to lose its heat deflection skills, and even lead to early roof replacements. It’s not all doom and gloom, though: We serve the Lakeland Florida community with roof cleaning solutions that remove the eyesore of an issue. This service is also preventative. With our cleaners, your roof will be more protected from black streaks in the future. If you see black streaks on your roof, don’t delay in getting a solution in place. Your wallet – and your curb appeal – will be the happier for it.